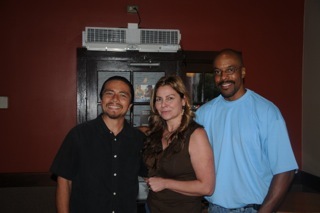 Senior Partners Richard and Katera Rutledge represent lifers and parolees across California. They have done over 2000 lifer and parole revocation hearings combined, as well as numerous Writs of Habeas in State and Federal Court. Rutledge & Rutledge has helped countless men and women earn parole grants at their hearings, obtain court orders for new hearings, and also have won release orders despite Governor reversals. The firm writes Advance Hearing Requests pursuant to Marsy's Law. Katera Rutledge gives seminars on lifer hearing preparation and you may download her free handbook. Our attorneys are dedicated to thorough preparation for all lifer cases, including 3-Strikes. See our testimonial page to see what some of our clients have to say about our zealous representation at Board of Parole Hearings and victories in Writs of Habeas cases. Attorney Katera Rutledge with newly released clients at a local Starbucks in Los Angeles. Rutledge & Rutledge can help you with parole hearing preparation, parole hearings, challenges to denials and Governor reversals, C-File corrections, 115 Writs of Habeas', and challenging unfair parole conditions.